The Smart Peel 3-in-1 system has the same unique Microdermabrasion features, plus the benefit of Acupressure massagers or Red and Blue LED lights, a system that stands out from the rest. 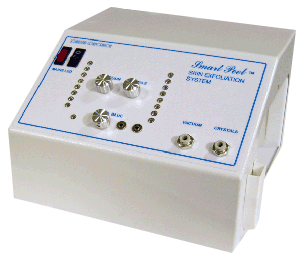 The unique 3 in 1 anti-aging program of exfoliation, stimulation and rejuvenation is the ultimate facial experience. After a Microdermabrasion treatment the skin is deep cleansed and receptive to photo rejuvenation. Red LED light helps to stimulate Collagen and Elastin production, while blue LED light is anti-bacterial and beneficial for acne prone skin. The combination of red and blue phototherapy helps to promote micro vascular circulation to create oxygenation within the dermal layers. Creating new cell growth will aid the regeneration and rejuvenation process, long term this will help to restore the lost vitality to the epidermis. Following a Microdermabrasion treatment the epidermis is receptive to serums and vitamin enriched products, and the acupressure massagers are beneficial to drive the products into the dermal layers. Stimulating the acupressure points will create a feeling of deep relaxation to help reduce stress levels, also helps to tone and tighten facial muscles. A course of treatments will help to reduce the appearance of fine lines around the eyes and mouth. Improved micro-vascular circulation aids the lymphatic drainage and toxin removal process, creating a healthier dermis will help to reduce spots and skin blemishes. Red LED light creates stimulation within the dermal layers, it is also anti-inflammatory and the combination of red and blue light is proven to be beneficial for problematic skin. While the combination of red and blue LED wavelengths is proven to influence the elasticity content of new cell growth, they also have a calming and soothing effect on the epidermis. Acupressure massagers stimulate deep into the subcutaneous creating a feeling of deep relaxation to aid stress reduction. Individual electronic control of vacuum and crystals that are free running with no clogging. Five filters in each system, sealed crystals avoids contamination. Acetyl hand piece with the option of disposable tips for each client, meets the stringent health and safety regulations that are being implemented worldwide. Light weight and portable with low running costs. Dimensions: L 12″ x W 12″ x H 7 1/2″. Weight: 20 lbs. NEW Smart Peel machines have a 2 year conditional warranty. All Smart Peel systems sold and serviced by BHC International USA or Soundskin LLC have been supplied by BHC International in the U.K. a registered FDA Medical Device Manufacturer.